"Starter Seeds" - a full-size photo of "Florrie's Garden Extraordinaire" Quilt, more detailed Posey instructions with charming flower quotes, etc. "Flower Pot Recipes" - you can actually bake in terra cotta flower pots! "Posey Party Plans" - have a group of friends over for a Posey Party! Decorations, invitations, flowered recipe cards, name badges have all been designed for you! We even have Flower Pot Mugs! "Historic Tidbits" - the most significant section! 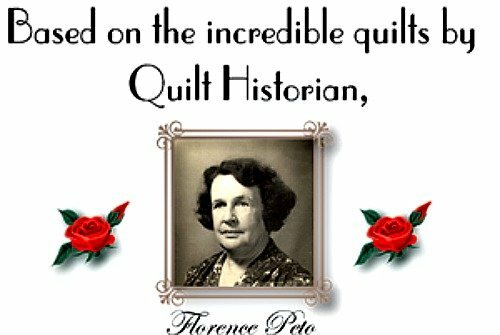 As I learn more and more about the life and mission of Florence Peto, I create a flyer to add to your binder, so it is continually "growing"! Organizing sleeves for the Historic Tidbits in the Posies are also included. If you choose to be on auto-ship, you will receive 6 or 12 Posey Packets® (your choice) every three months. It is not mandatory and you may drop off auto-ship anytime. you will still be in the Club, you simply order what you want, when you want it. Please indicate in the NOTES section of the online order page (or you may email us) that you'd like to be on auto-ship! ALL THIS - Posies 1-12, the Gardening Tote, the Coupon Book, and the Binder that continues to 'grow" is included! You then have the privilege have buying the Posey Packets® at a 10% discount and free shipping within the continental US (International customers contact us for a quote). Come join the Club and be one of Florrie's Gardeners!